Last revised June 7th, 2000. This page contains some photos not used at all on the web page! 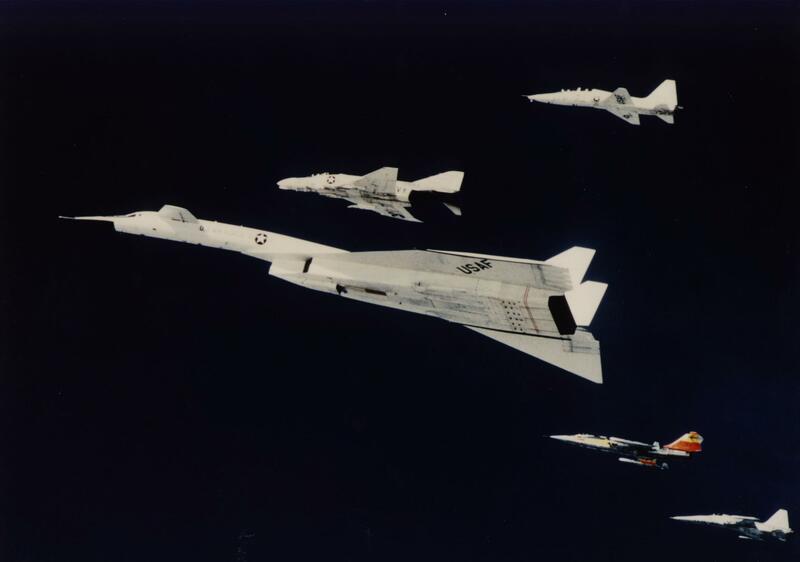 Another Note: This page would not have been possible without the help of Dr. Ray Puffer and all the other folks at the Edwards AFB history office, where they let me spend hours going through their files on the XB-70, and showed me how to use the copy machine (hey, I admit it, copy machines and me do NOT get along). 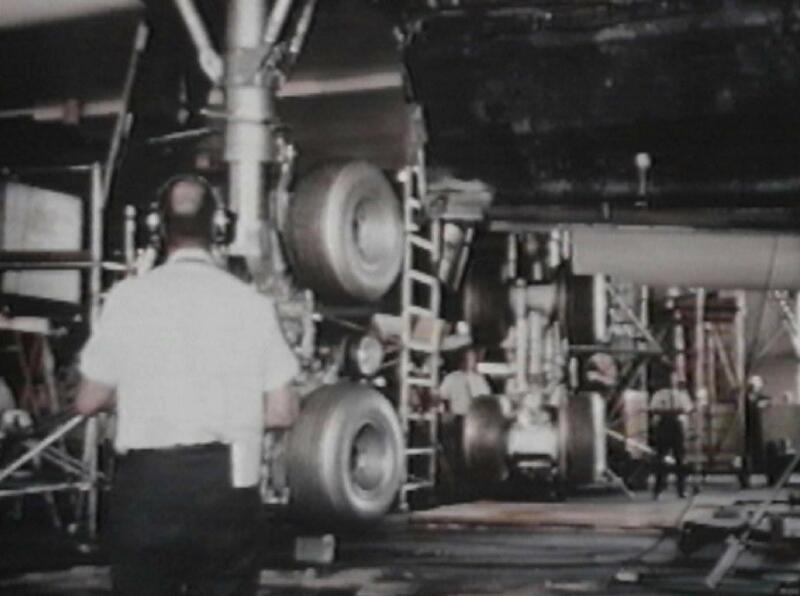 Eric Canale was kind enough to scan many of these images from photographs. 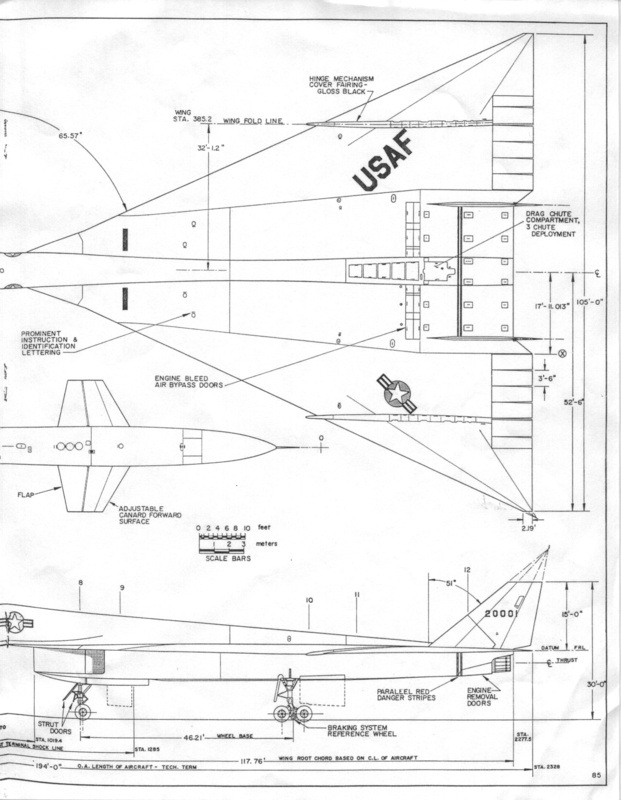 Three-view plans for the XB-70! There are now two versions of these images... the large ones, and the smaller versions, which also print out on a standard printer. 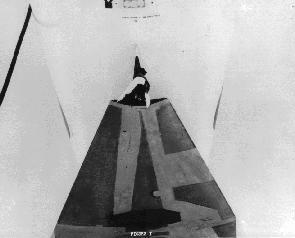 A black and white shot of Ship One from above. It's the only thing I've gotten from Rockwell/North American Aviation. 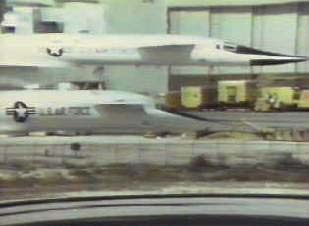 Here's a grab from video of both aircraft together. The downside is that you only see the necks of them. 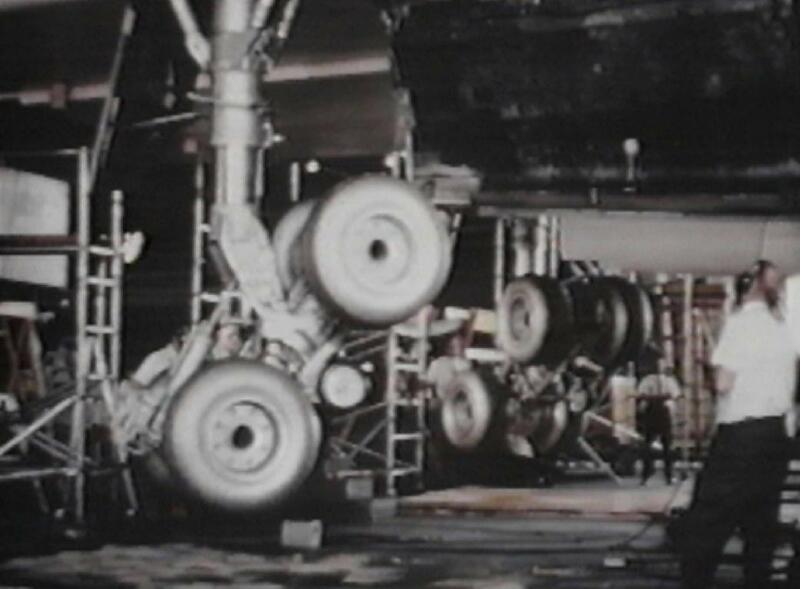 For the astute, notice that the underside of Ship Two's nose is painted black. It also shows the differences in the noseramp-up and noseramp-down positions. 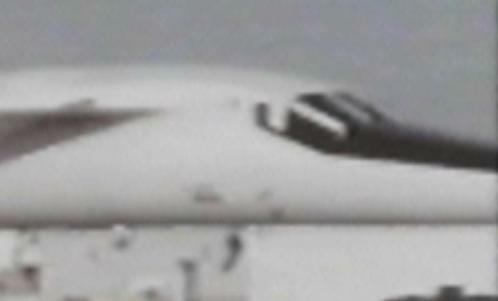 Another grab from video, taken just after Ship One returned from its Mach 3 flight. 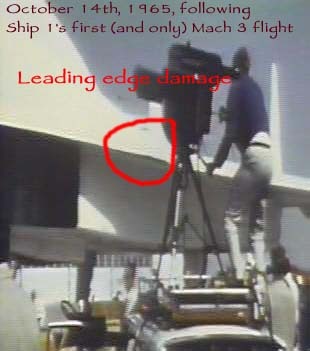 I've circled the damage suffered to the leading edge -- It's not highly visible, but it's the best I've seen of it. 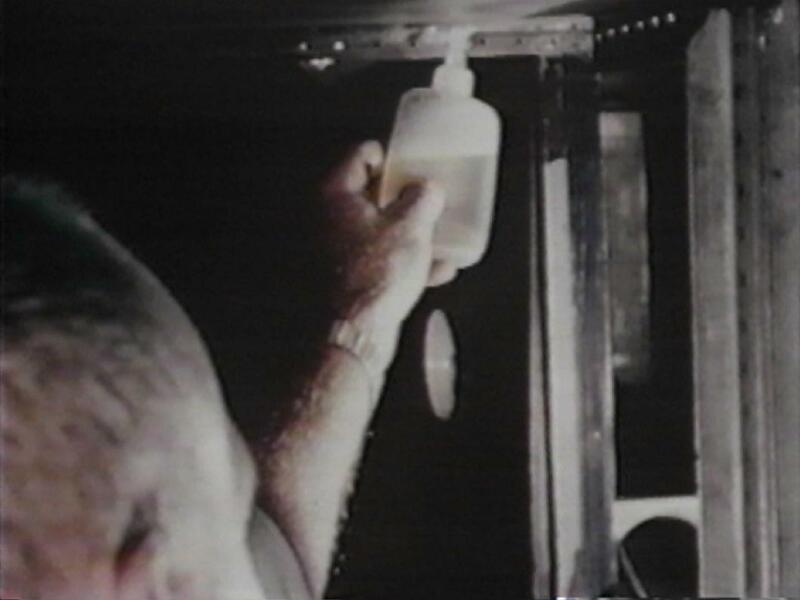 This is a shot of an engineer checking for leaks within the fuel tanks. 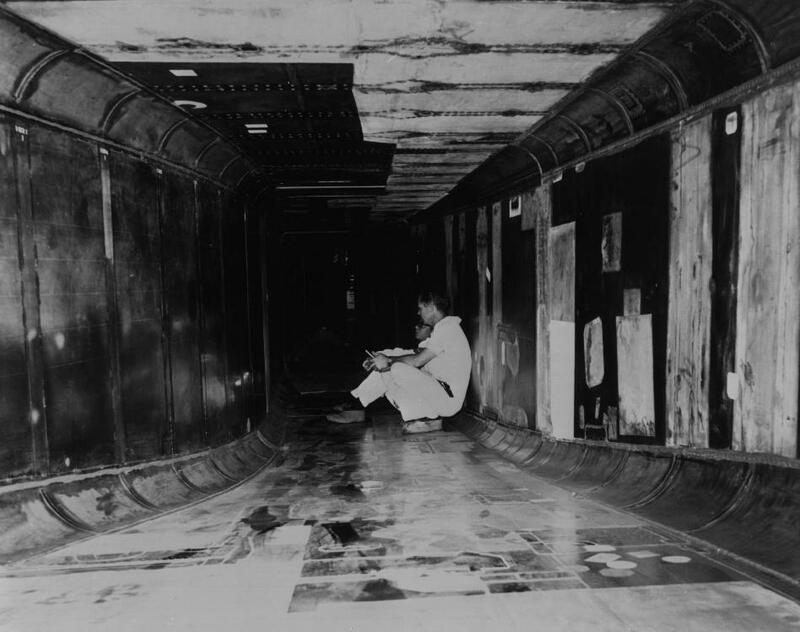 Actually, they aren't tanks at all, but just sealed sections of the aircraft. 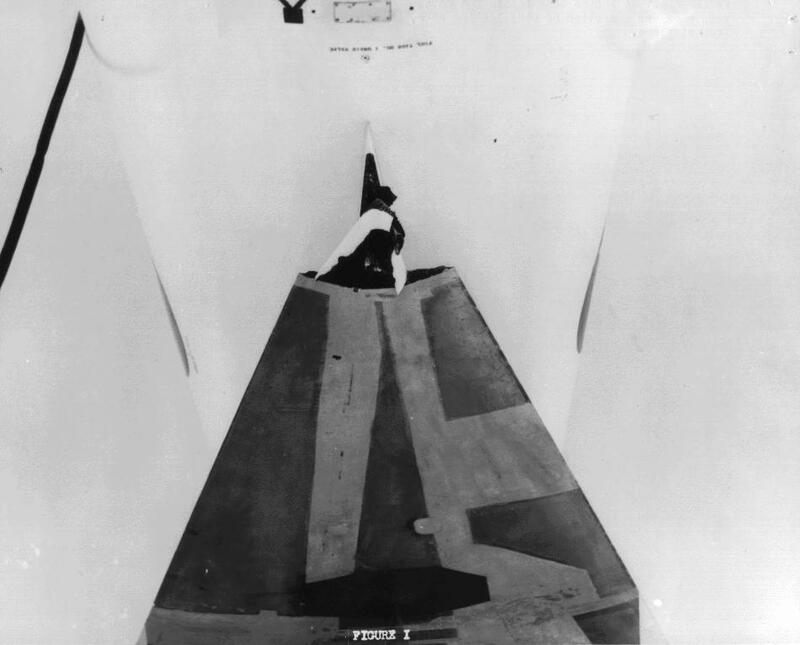 Consider, this gentleman is STANDING in this tank, and reaching UP to the top seam. That's a big tank! 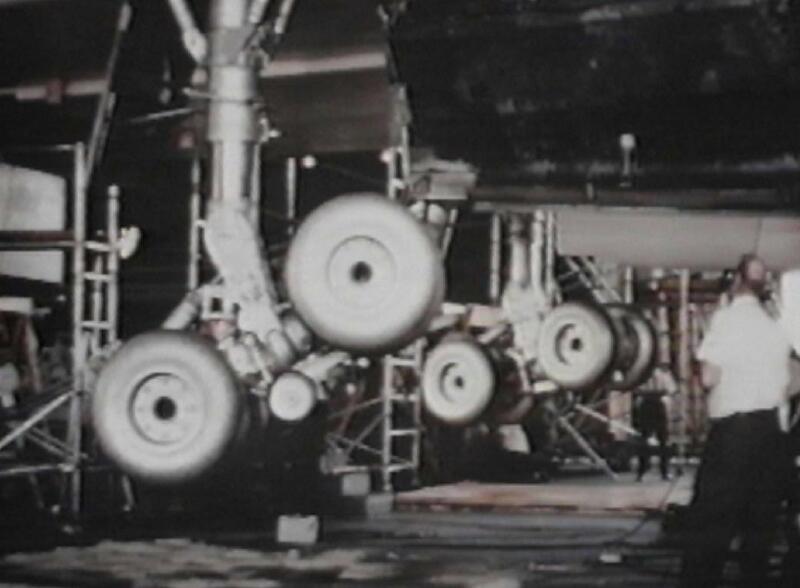 This is the gear extension sequence, show during testing in late 1964 at North American's Palmdale facility. (These are all roughly one size, large, and go in order 1 - 8. Better views of the noseramp positions -- there's no real advantage to viewing them at this size rather than what's on the page, but I thought I'd put them here anyway. 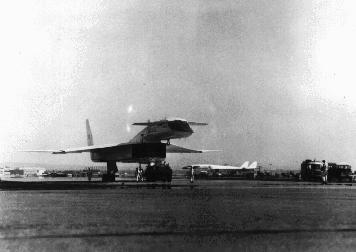 AV/1 back on the ramp at North American's Palmdale facility after flight number four, where too-thick paint had peeled away from portions of the airframe. 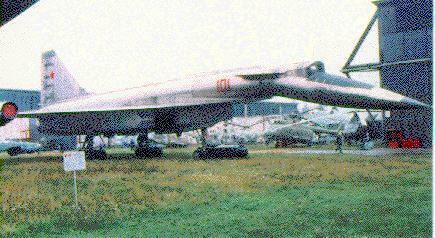 Another odd item, the Soviet SU-100, which was blantantly a Soviet copy of the XB-70. 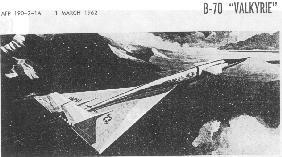 A kind reader sent me a copy of an article on the aircraft, which has a rather interesting history -- most notable, it was one of the first fly-by-wire aircraft (the Soviets simply avoiding the high-temperature hydraulic issue entirely) (The Avro Arrow was appearently a FBW aircraft as well -- thanks to Dan Garcia for pointing this out). It made a total of ten flights, which a best speed of M1.4. 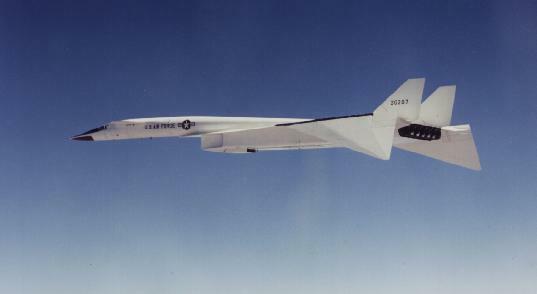 It was to weigh somewhere around 225,000 pounds, and have about 140,000 pounds of thrust, to achieve Mach 3. 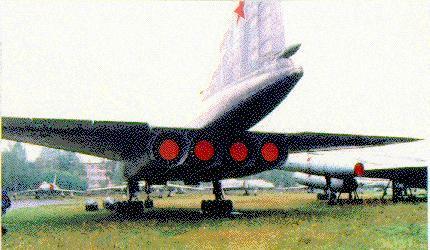 (Note the vastly higher thrust to weight ratio the Soviets figured they needed!). 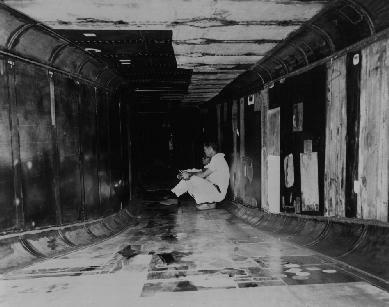 I suspect that, without lowered wingtips to add stability, and with the troubles of an early fly-by-wire system, at M1.4 it must have been quite the white knuckle ride! 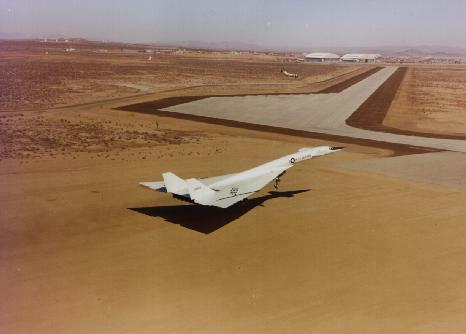 AV/1 taking off from North American's Palmdale facility. I'm not sure if this was the first or fifth flight, the only times Ship One flew out of Palmdale. 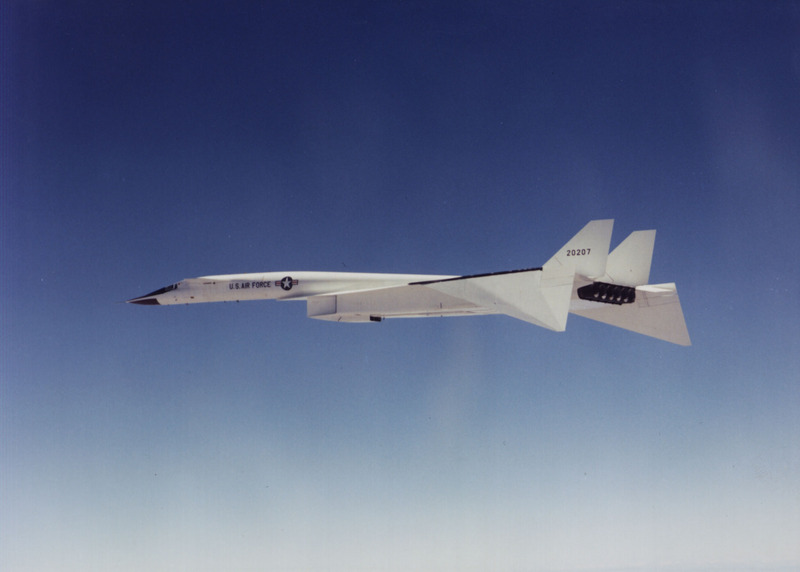 A decent NASA shot of AV/1 with wingtips at 65 degrees, with the noseramp down. This is the closest pre-midair formation picture I've seen. (If anyone has one that's better, I want it!). 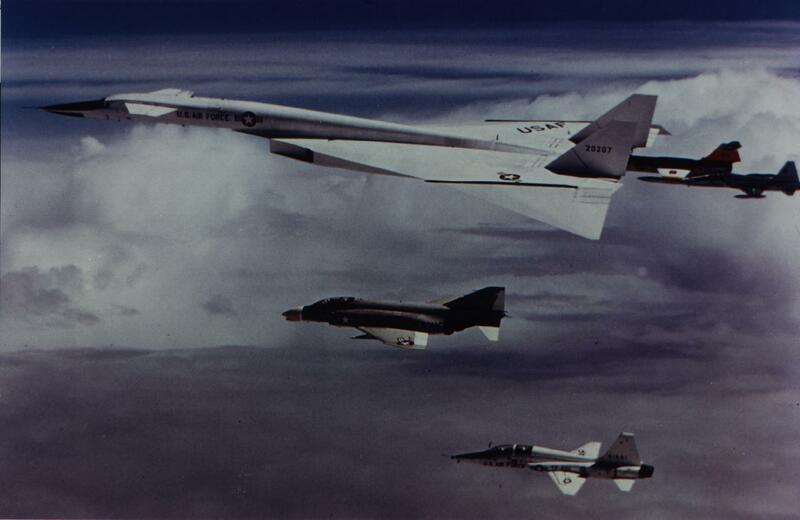 Notice how everyone has pulled in dramatically, and Joe Walker's F-104 has pulled forward of the wingtip, so Walker is using the side of Valkyrie to judge his position. I've done a small, large, and cropped image here. This is a drawing in a USAF publication from early 1962 (meaning the sketch was made even earlier). 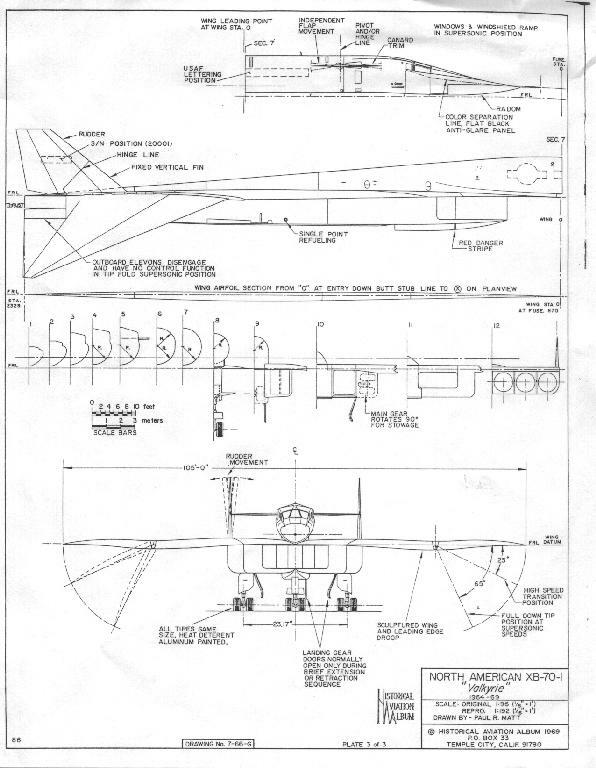 The short article listed lots of information, such as speed, weight, and altitude as "classified." 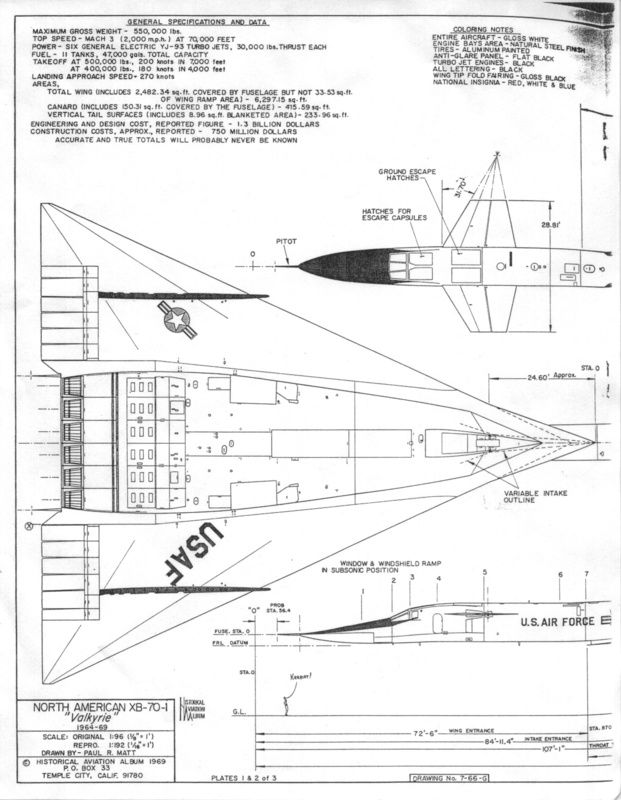 The drawing itself is a good representation of the earliest design studies. Notice there's no provision for wingtips. 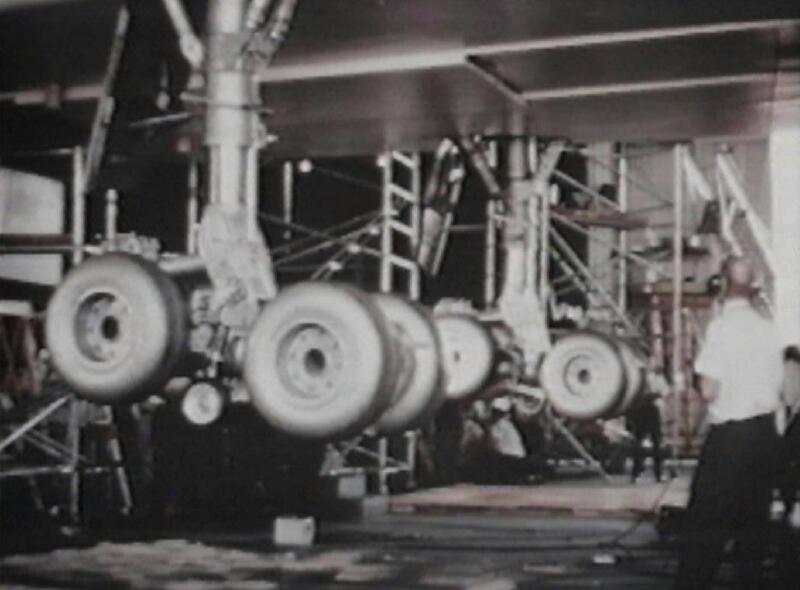 The elevons are shown as one-piece units, and there are the dorsal strakes preceeding the vertical stabilizers. In addition, it shows the nozzles projecting beyond the upper fuselage. 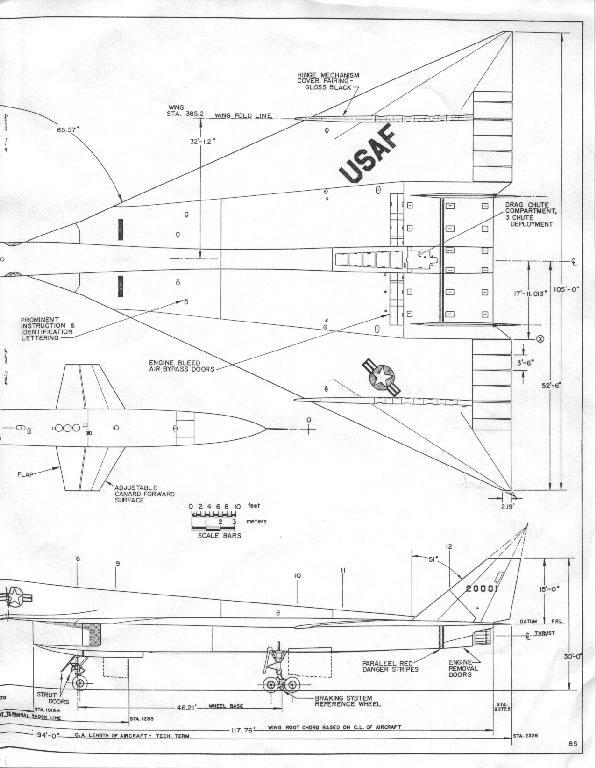 A lot of these characteristics carried into flight-pins, etc for the XB-70. 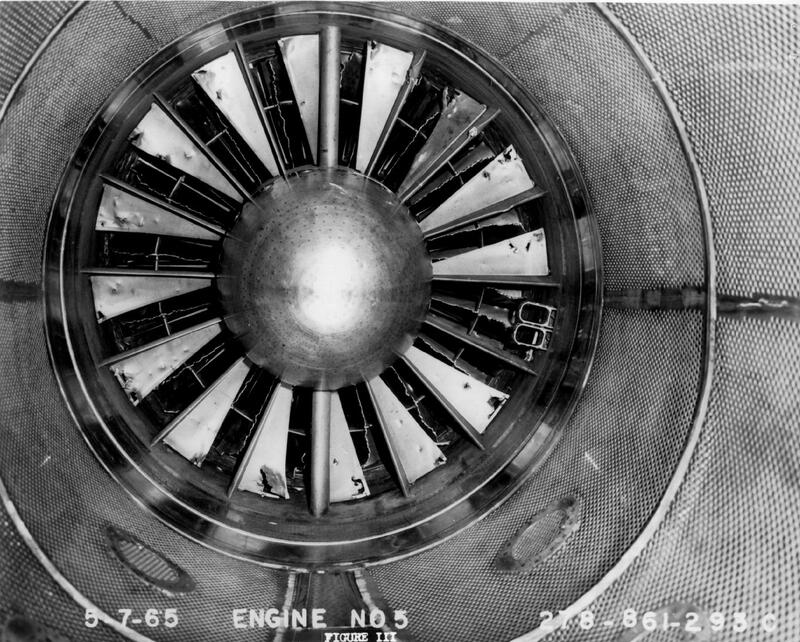 This is a picture of the right-side intake tunnel housing the #4,5, and 6 engines after Ship 1's horizontal splitter came off on the 12th flight, at a speed of Mach 2.58. 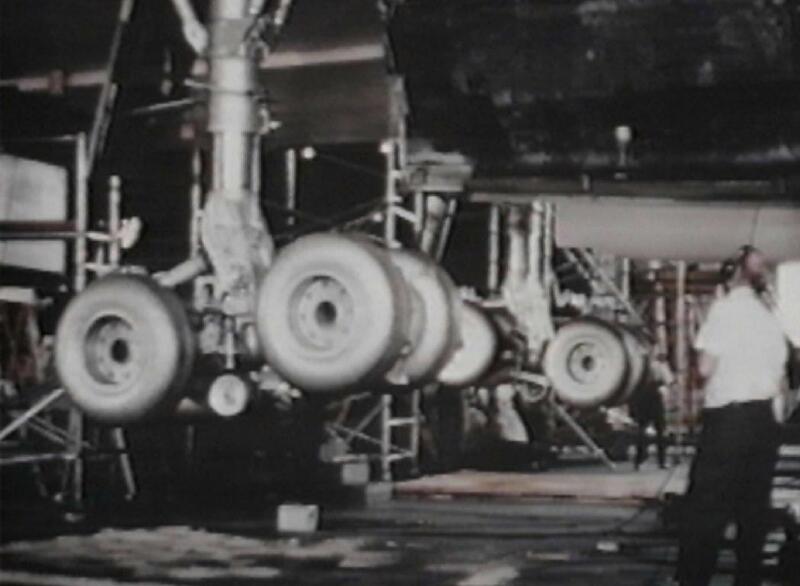 Because of detail, the small image here is actually a cropped closeup, and the large image shows all 3 engines. 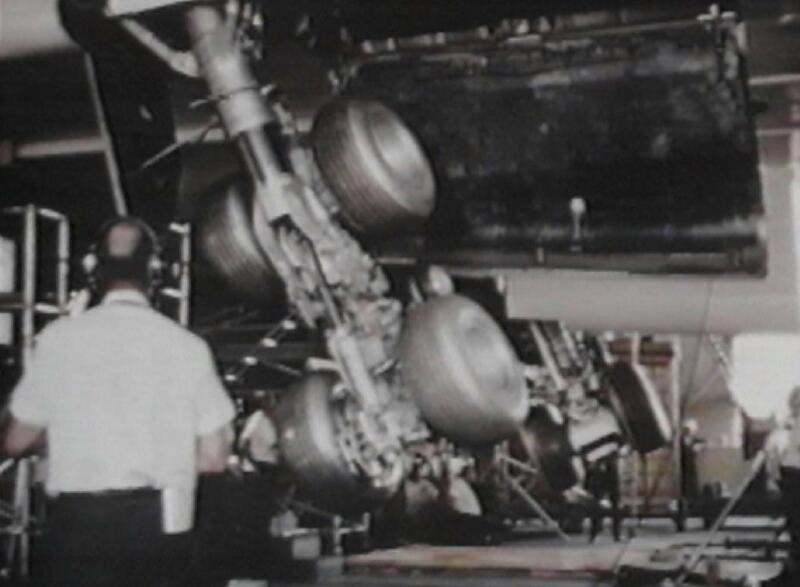 The #5 engine itself, which, although severly damaged, was actually restarted during the final approach to privde some thrust from the right side of the aircraft. 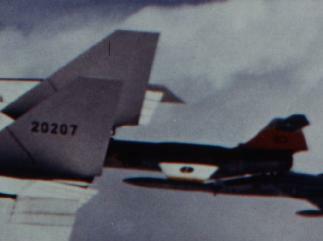 This small image is also a cropped closeup. This is the letterhead which North American was using for all their press and official releases, and I thought it was cool. Possibly the cleanest shot in existence of Ship 2 inflight. At least, it's the cleanest I've ever seen. Noseramp up, wingtips down, it highlights everything that is so magical about the Valkyrie. This photo was so stunning at the resolution we originally scanned it at (something like 3000x2000) that I'm making all three versions available. 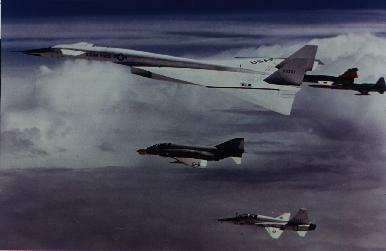 This is another photo from the formation prior to the midair. 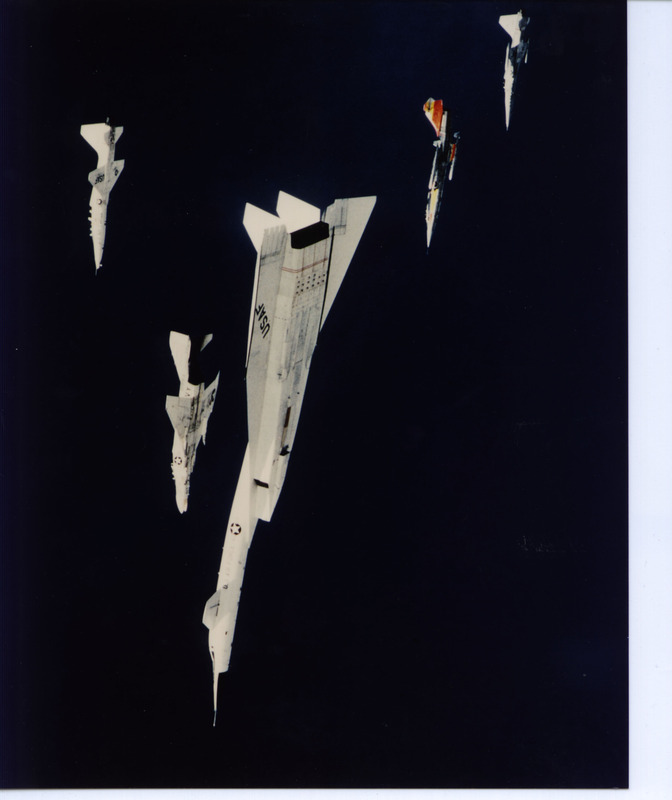 It's not the ultimate photo as far as demonstrating the closeness of the formation (that's a photo I haven't got scanned in yet), and the dark blue background washed out to a black. I'll include the source scan (another big monster JPG) in case someone can color-manipulate it a bit (although I'm afraid I have to do that at the scan-point). 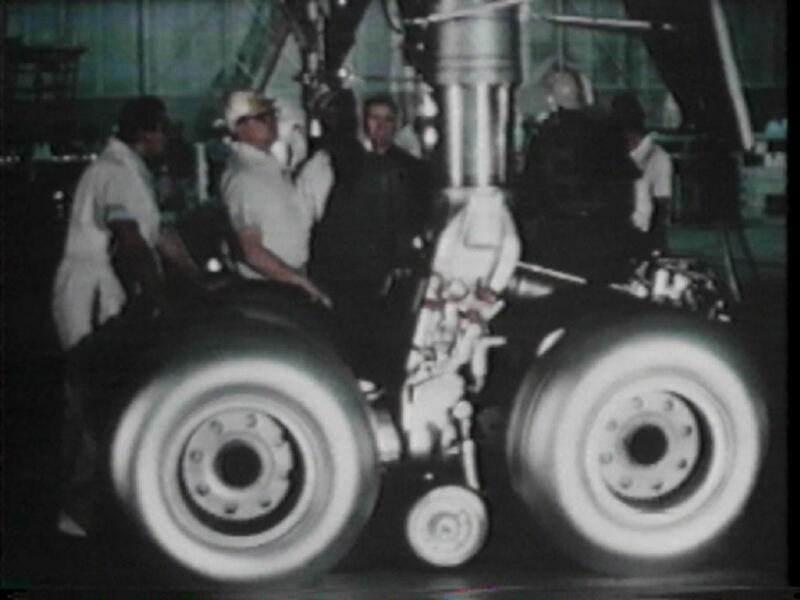 A very cool shot of Ship 1 on what I am fairly sure is it's first landing (if anyone can prove or disprove, let me know). 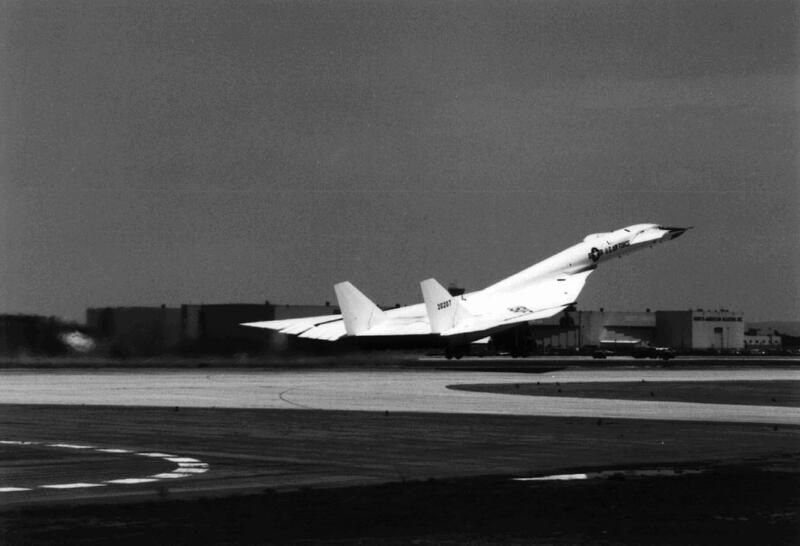 A very shallow, 1 degree glide slope was used during landing (a typical airliner comes in a 2.5 percent, I believe, the Space Shuttle at around 22 percent). 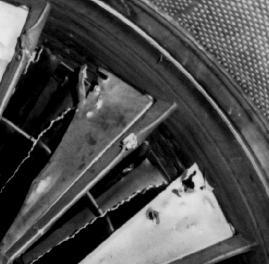 Angle of attack was 9.5 degrees, and at 11 degrees, you'd bounce the nozzles off the ground -- generally considered to be a "bad thing." 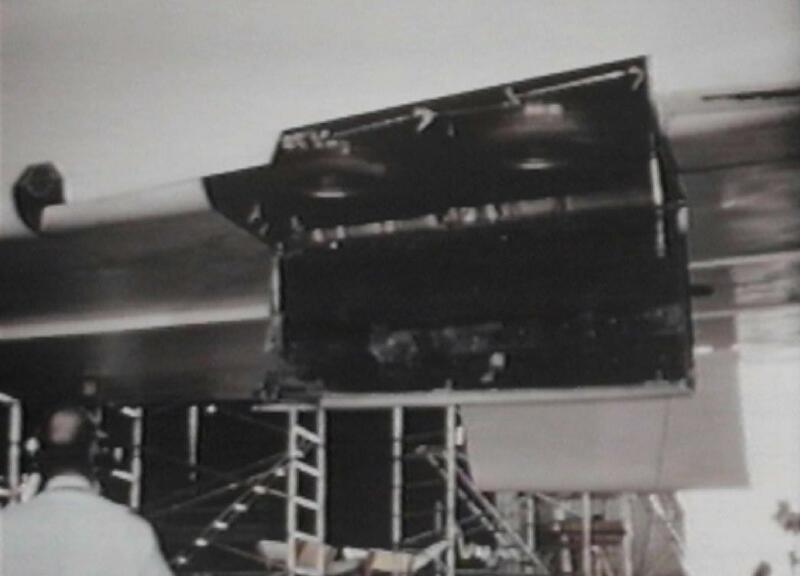 The remains of the horizontal splitter (it's that very apex of the delta wing), from which, on Ship 1's 12th flight and at a speed of Mach 2.58, the honeycomb "skin" broke away and drove through the intakes, forcing the shutdown of 4 of the 6 engines (one was restarted for the actual approach, all were destroyed beyond repair). The splitter was replaced with a solid-framed unit after this. Ship #2 making its first takeoff. You can see the dihedral very well in this shot. 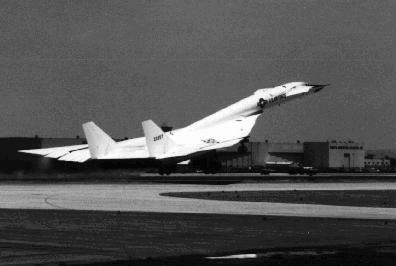 Both XB-70's on the ramp at Edwards. This is only the second picture I've seen with them together, both are black and white, and both poor. I'm still looking, though. 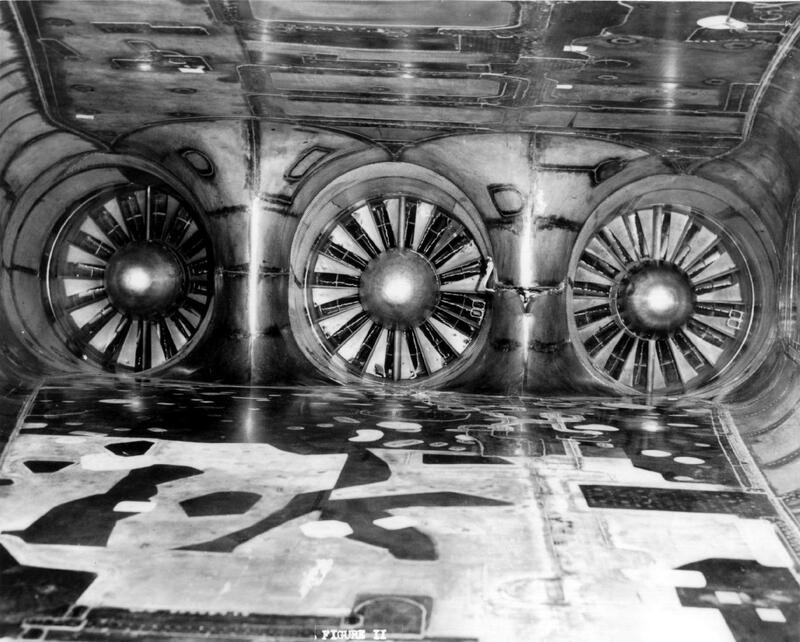 Here's a shot that really shows the size of the intakes. 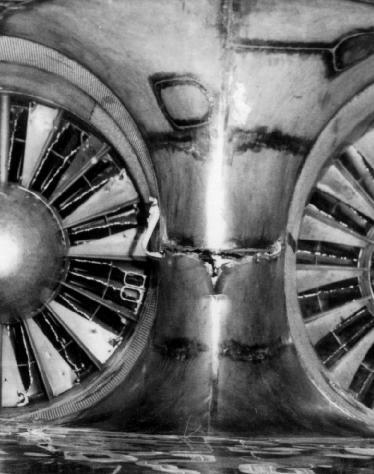 It's a couple of guys sitting in the intakes going over some plans. Well, that's all for now. I will probably get another couple of shots in here before I get the new page done.